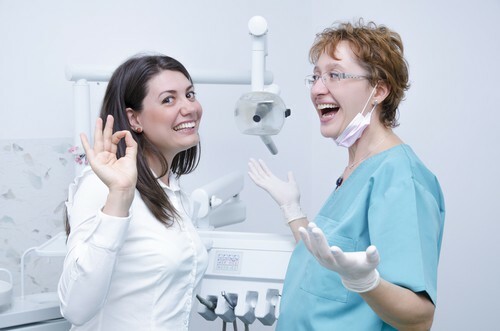 My patients know the importance of maintaining great oral health thanks to regular cleanings and checkups. They also understand the power of prevention, to make sure pesky problems like cavities, gum disease, and root canals don’t happen. It’s a win-win situation that makes everyone smile! Gum disease can be damaging to not only teeth, but studies show it may be connected to other problems in other parts of our bodies that can affect overall health. I enjoy seeing my patients’ healthy gums and knowing they’re free of disease. I want only the very best for their smile and the rest of their body too. Building long-lasting relationships with patients is a main priority for me, but it’s also something I strive to do with my staff too. I care as much about my patients as I do my team. When we are happy and working well together, we can provide patients the very best dental care possible. Your dentist in Douglasville understands that a trip to the dental office usually isn’t on the list of things people are most excited to do. Going to the dentist doesn’t have to be unnerving. It makes me so happy to help put a nervous patient at ease. I want to see them smile, and I truly enjoy going out of my way to do so! Any dentist will tell you, one of the best things about what we do is helping a patient really get to love and be proud of their smile. It’s gratifying to see them speak and smile with confidence. At my Douglasville dental office, my team and I never grow tired of helping, treating, and seeing healthy teeth. Our patients truly make what we do enjoyable and gratifying. If you or someone in your family is in need of a checkup, please do not hesitate to give us a call. We’re always happy to see you! Welcoming patients from Douglasville, Lithia Springs, Villa Rica and the surrounding areas. With the holidays just around the corner, there are going to be tempting foods and beverages hitting the dinner table and gracing party spreads. This can pose a real challenge with patients who rely on full or partial dentures. My Douglasville dental office knows that some foods (no matter how tempting) just don’t mesh well with dentures, and we try to get patients to steer clear of them to avoid possible pain or discomfort. We ask denture patients to try and keep these things in mind when deciding what snacks you’re going to have. Decaffeinated Coffee: We know this is easier said than done. But drinking large amounts of the caffeinated stuff can lead to less saliva production, which means a dry mouth. Denture wearers want to ensure their mouths are moist whenever possible to avoid pain from possible friction. Sugar-Free Gum: Sweet treats don’t have to be completely off the table if you wear dentures. Just reach for a more denture-friendly alternative such as sugar-free gum. There’s are even kinds specifically made for people with dentures. Olives, Grapes, Etc. : Soft-textured, healthy snacks like pitted olives are good for your heart and won’t get stuck in dentures. You can also try seedless berries and grapes! Your dentist in Douglasville knows it’s not always easy to have denture-friendly snacks and beverages on hand, especially if you’re traveling for the holidays. Here are a few foods it’s best to avoid or limit. Nuts:These delicious treats can be tricky to eat when you have dentures. Pieces of nuts can get stuck in full and partial dentures causing discomfort. Seeds: Just like nuts, seeds also tend to get stuck and lodged in uncomfortable places. Try opting for some whole grain breads where the grains are baked inside. Steak: Chewy steak is tough to break down with dentures. 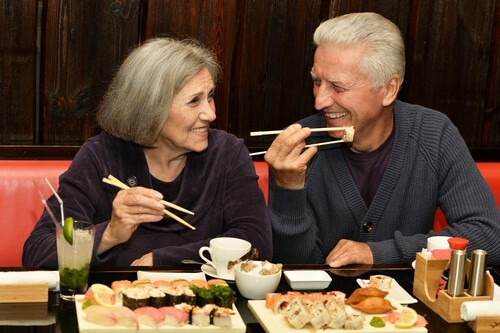 Biting into steak and other tough foods can make dentures unstable, causing them to dislodge. They can also lead to sore spots. The team at my dental office in Douglasville wants you to be comfortable living with dentures. It’s just a matter of taking the time to make them work for your and your lifestyle. Sometimes accidents happen and problems are unavoidable, but watching out for troublesome foods and drinks can be a big help to avoid any issues. If you have any questions about denture care, please don’t hesitate to give us a call!